Please note: our program is designed for riders who have enough experience to ride "off leash" and join small group lessons. No prior dressage experience is necessary. If you are a beginning horseperson, see our "Beginners" page. If you are interested in children's lessons, see our "Children" page. Lessons last 45 minutes, of which 30 minutes is almost always the minimum saddle time. 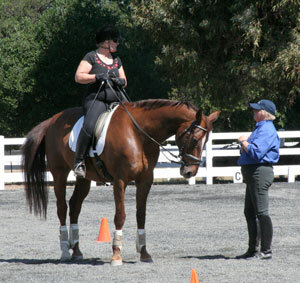 If you are in a group lesson, you will generally be in the saddle for the full 45 minutes. Please be sure to arrive 15 minutes before your lesson starts, so that you can groom and tack up your horse. (In general, don’t take your horse out of his stall more than 15 minutes before the lesson starts, so that he can drink and eat and so on, as necessary.) Please also allow yourself 10 minutes after the lesson is over, to clean up your horse and wipe down your tack. Everyone must wear an SEI-approved safety helmet, specific to horseback riding. Please note that the helmet must have been purchased within the past 5 years and be free from incidents. As well, please wear breeches, paddock boots & half-chaps or tall dress boots, and gloves. For your first few lessons, we can loan most of you a helmet and many of you paddock boots; you should wear long, comfortable pants and closed-toed shoes. Please also note: if we do not have a helmet that fits your head comfortably and safely, you will not be able to ride until you have a helmet of your own..
Before your first lesson, we’re going to ask you some questions about your body and your life: how old are you, how tall are you, how much do you weigh, what is your current exercise program, do you have any physical/mental issues that could make riding more difficult, etc ? We ask them so that we can make sure that we have a horse that can carry you safely. You have probably already given Pamela your credit card information to secure that first lesson. If not, she’ll be contacting you shortly to arrange this. We have a 48-hour cancellation policy, with some exceptions: (1) if we have to cancel because of weather or other unforeseen circumstances, of course you don’t have to pay and (2) if you are sick or there is another emergency, we may waive the 48-hour period and (3) if, at the time of the lesson itself, we feel that we cannot safely put you on a horse, you have the option to take a dismounted, horsemanship lesson or get a full refund. Pay as you go: private lessons, semi-private lessons and group (usually 3-4 students) lessons. 5-lesson packages: Once you have purchased a 5-lesson package, you may choose from the lesson times available each week, that are appropriate for you. Monthly packages: these are for group lessons, although there is no extra charge if you end up in a private or semi-private by default. The monthly packages are the most economical way to ride more than once a week. When you purchase a monthly package, you pay for an approximate number of lessons. Built into the price is the assumption that vacations, illness, bad weather, etc, will result in some missed lessons. As the per-lesson price is very low, we don’t guarantee make-ups, although we’ll do our best to reschedule missed lessons. Please see here for a more detailed explanation of makeup lessons.